Marc Marquez currently sits third in the MotoGP World Championship standings. 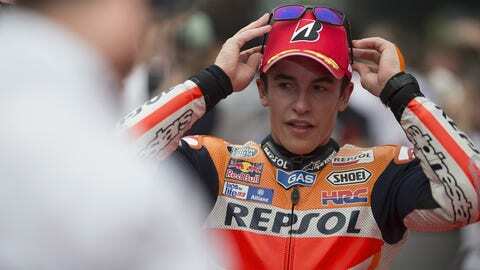 Two-time MotoGP world champion Marc Marquez was assaulted by Italian reporters at his house in Spain on Friday, a report said. The crew was from an Italian TV show “Le Iene” (The Hyenas). Reporters Stefano Corti and Alessando Onnis, along with a cameraman, were reportedly waiting for Marquez at his home as the Repsol Honda rider was returning from a day out dirt biking with his brother and father. Marquez refused to be interviewed by the crew who then began mocking him before following him into his garage where a scuffle ensued in which Marquez reportedly suffered a scratch to his neck. "A group of people appeared at the rider’s home and shouted a series of insults, made certain ridiculous and humiliating actions towards the rider himself and even pushed and assaulted his closest relatives. "Given the seriousness of these actions, such acts have been condemned and the normal course of criminal proceedings will be followed against such persons." “Our Hyenas Stefano Corti Alessandro Onnis this afternoon and went to Spain to try to deliver to the pilot of Motogp Marc Marquez the ‘Cup of S***,’ A special prize designed to celebrate the ‘deeds’ of the sample Spanish. But things didn’t go as expected. Marc Marquez was involved in a controversial incident with Italian rider Valentino Rossi at last weekend’s Malaysian GP.